The Kodiak Bear is not only the largest terrestrial predator in Alaska, it is the largest terrestrial predator on the planet. It is difficult to capture in words what it is like to confront one of these enormous animals in person; it is simultaneously humbling, awe-inspiring and startling – it is impossible to meet a bear and not form a vivid memory in the process. We consider ourselves fortunate to live amongst the bears, and at times they are a constant influence on the fishing experience. The Kodiak Bear is a genetically unique species of bear, separate from both the coastal Brown Bear and the interior Grizzly Bear. They have the capability to grow larger than any other bear, including the Polar Bear. Depending upon the year, there may be a lot of them at Saltery. 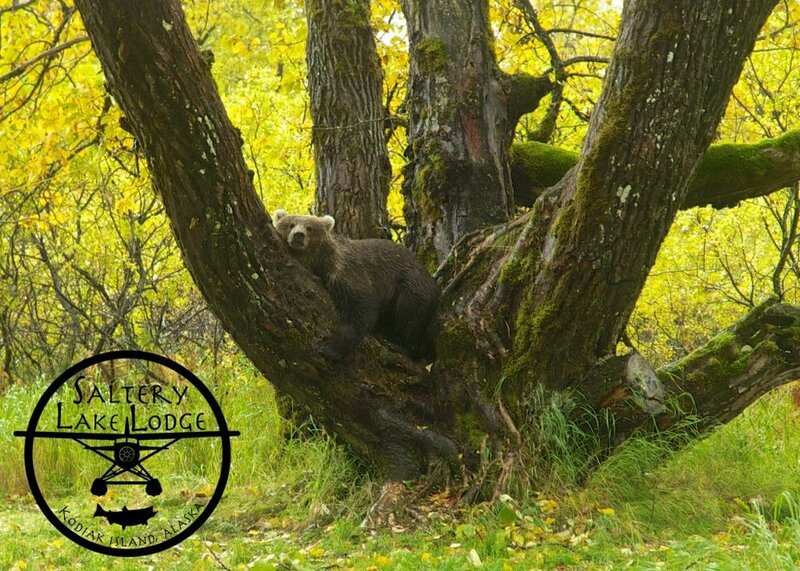 When you see a Saltery bear, they will most likely be in the process of finding or eating food. The caloric budget for life as a bear is enormous, especially in anticipation of hibernation, and bears do little other than eat the entire time they’re away from their dens. Due to the temperate climate of Kodiak Island, about a quarter of Kodiak Bears do not hibernate, and remain active during the Winter months. The rest of the bears will begin denning on high mountain slopes in October, and remain in a state of partial consciousness until May. During this time, female (sow) bears will give birth to litters of between two to four cubs. One or more of these cubs will sometimes not survive the steep inter-sibling competition for milk; Spring sows are typically seen with no more than two cubs. As soon as the bears are revived, they are ready to mate; sows are usually impregnated early in the season. Fascinatingly, the fertilized embryo will become attached to a lining in the sow’s uterus and remain dormant until later in the Summer, when it detaches and begins to grow when the sow is more physically healthy and has better access to food. Although Kodiak Bears are not territorial, they are mostly solitary; with the exception of sows and their attendant cubs, bears are rarely seen in the company of other bears. Every bear has a “roaming” area of a few square miles, and often a bear will spend its entire life within those borders. For the most part, bears will walk a circuit up and down the rivers that are most familiar to it, actively ambushing salmon in the water or, later in the season, scavenging on fish carcasses.